Oswego, NY – The Fulton Public Library and OCO’s Cancer Services Program invites women of all ages to attend a health fair designed exclusively for them. Scheduled for October 17, the event, which is free and open to the public, will be held at the Fulton Library, 160 S. First St., from 11 a.m. to 1 p.m.
Carolyn Handville (right), program manager for OCO’s Cancer Services Program Partnership, meets with Sandy DeSantis of the Fulton Public Library to finalize details for the Women’s Health Fair that the library will host on October 17.Carolyn Handville (right), program manager for OCO’s Cancer Services Program Partnership, meets with Sandy DeSantis of the Fulton Public Library to finalize details for the Women’s Health Fair that the library will host on October 17. 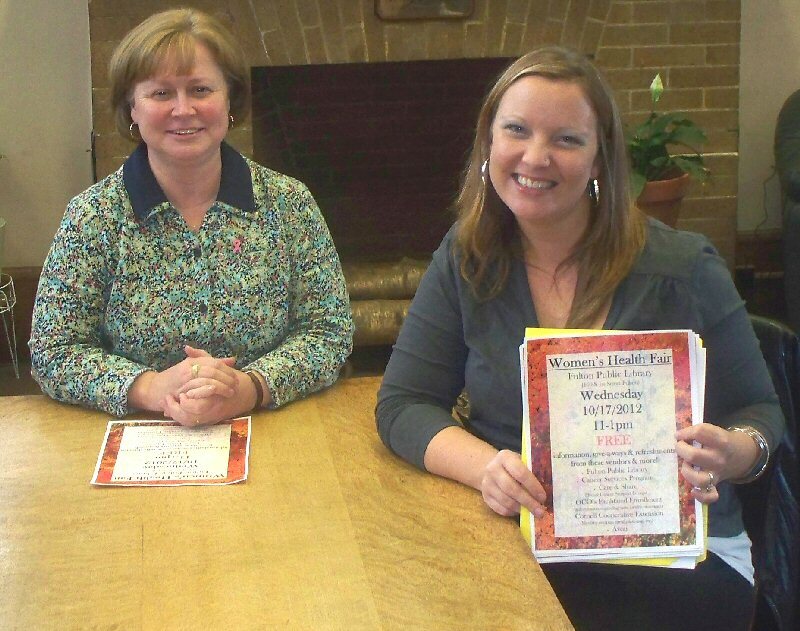 Planning committee member Carolyn Handville, program manager for OCO’s Cancer Services Program Partnership, said that the Women’s Health Fair is a must attend event that women will find fun and educational. “We have put together a special day for women where they can come and not only get some spectacular information on available health resources in Oswego County, but also enjoy free refreshments and program give-a-ways,” she said. According to Betty Maute, director of the Fulton Public Library, the Women’s Health Fair will feature several vendors offering a variety of free services and information. Cancer Services Program- Scheduling FREE cancer screenings and distributing FREE colon cancer screening kits to eligible participants. Cornell Cooperative Extension – Information on meal planning, healthy recipes and label reading. “I encourage women to not only join us at the Women’s Health Fair, but to bring a friend, a daughter, a neighbor. It will be a very special event that will be of interest to all women,” added Maute. For more information on the fair, call Handville at 592-0830.